How do you deal with reality, when it trumps your fiction? When it threatens to make it obsolete? Three weeks left to the release of my next book. 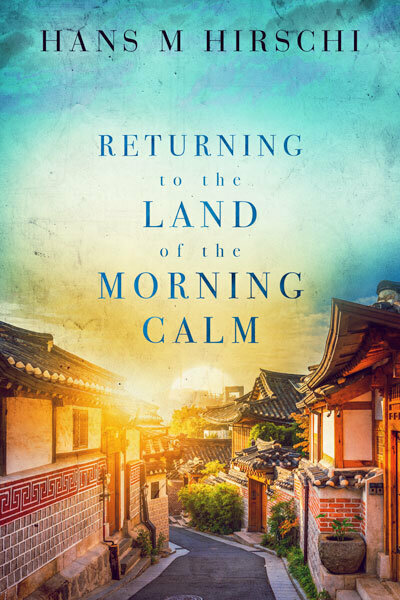 Returning to the Land of the Morning Calm is a story where Korea plays a major role, not just the Koreans depicted in the plot. When I first began to write about Martin, an octogenarian in America, you realize quickly that people in his age were very likely to have been conscripted, or “drafted” as we normally say. Given his age, the Korean War was also a given, not that all drafted young Americans would’ve ended up there, but Martin did, and the story took its course. Mind you, at the time I began to write the book, Korea was in the news almost daily. And not in a good way. One was called “dotard”, the other was insulted with regards to the size of their “buttons”, and for a while, it seemed as if the fragile seize-fire at the 38th parallel was seriously threatened. North Korea’s testing of ballistic missiles even had some of my friends in California afraid for their personal safety. I remembered the eighties and our fear for Russian missiles raining over Europe. War, a world war even, seemed suddenly possible. Having visited Korea in the past, I was afraid for my friends in Seoul, who live less than fifty miles from the border and who can be reached by conventional artillery fire from the north, let alone nuclear weapons. I later learned what Kim’s grandfather did to Seoul during the first days of the Korean War, and it scared me. A historic meeting? Only time will tell. IMAGE CREDITS: KOREA SUMMIT PRESS POOL/GETTY IMAGES. As I was watching the images on my TV screen last week, of the quickly arranged summit between the two leaders of Korea, of Kim crossing the border (last time a leader from the north “visited” the south was Kim’s grandfather, when he rolled into Seoul after more or less having flattened the city in four days) at Panmunjom, I had tears in my eyes. Yeah, I’m a softie. I watched on as the two men shook hands, all smiles, how Kim – unscripted apparently – invited President Moon to take a step back across the border into the north, have pictures taken before they anew crossed the border to the south for their meetings. At the end of the day, the two leaders had agreed on a range of topics, including negotiations to finally put an official rubber stamp to the war, which officially was never ended at the ceasefire in 1953. I finished writing my book in February, which says a bit about just how fast things are developing on the Korean peninsula. Because when I wrote the book, the Olympic Games had ended, and the symbolic visit of Kim’s sister had been a success. But the thirty-head cheerleader group had drawn more chuckles and head-shakes due to their weird behavior, than being perceived as a serious step toward detente. The story ends in early April, just a few weeks ago, and I don’t mention any of this in the book. And just last week, we worked through the edits and sent the book into proofreading. Not knowing what the future holds is making this so difficult. Not that we ever know what the future holds, but here in Europe, we can at least assume that the next years will be similar to the ones we have behind us. Development, not revolution. In Korea though, right now? I honestly don’t know. I’m always a skeptic, but even I have to be honest and admit that Kim’s moves have me surprised. Is he serious or what is he up to? Motivation in the south is different. The official stance of all politicians in the south is unification, just as it was in West Germany before 1990. That the population in the South, particularly the young, see things differently, is a different thing. They see just how big a sacrifice from the South would be needed to bring the North up to par. I’ve written about this before. So what do I do? What if I write the detente into the novel only to have reality suffer another setback? As a writer, I want my books not just to mirror my time, I’d like for my stories to be “timeless”, not primarily for commercial reasons, but because timeless stories are more relevant. It’s why we still read Shakespeare. His stories, the conflicts he describes are truly timeless. I’ll be honest: I don’t know what to do. I’m still thinking, talking to my publisher. If you have any recommendations, thoughts, please let me know. We have about a week or ten days to come up with a solution to this conundrum. It is a difficult choice. Perhaps an author’s note at the end, to state… well, pretty much what you’ve said here, that you have wondered about adding more to the story but it is early days to know how things go. Not having read the book (yet;)) it’s difficult to be more specific, although you might want to leave it open if you haven’t or mention that there are signs of movement. I am looking forward to the book, whatever you decide (and perhaps this will be one of those books that, although you don’t like series, will make you reconsider). Have a great week and good luck. Thanks for the comment. I already have added a line to my acknowledgments. I’m still contemplating adding something to the story itself, as I’d not want my characters to be completely “out of the loop” and appearing ignorant to their own surrounding, particularly given how big this is. To the Koreans, the separation is a daily reminder of pretty much everything in the past century, and the current events are (oddly reminding me of 1989, including the speed of things) as important to them as the fall of the Warsaw block was to Germany.